Pushed by Israel and Saudi Arabia, President Trump is edging toward war with Iran, possibly beginning with “mission creep” in Syria, a reversal of Trump’s campaign rhetoric objecting to military adventures, writes ex-CIA analyst Paul R. Pillar. The lobby pushing hostility against Iran. There indeed have been, and still are, focused attempts to stir up trouble. 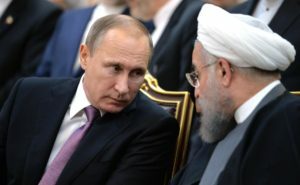 Politically potent interests have their own narrow reasons to keep U.S.-Iranian relations bad and to keep Iran isolated. Foremost among those interests is the right-wing government of Israel, for which Iran as chief bête noire serves to cripple a competitor for regional influence, to explain all regional trouble in terms that do not relate to Israel, to distract attention from matters (especially the occupation of Palestinian territory) the Israeli government would rather not discuss, and to keep the United States wedded to Israel as supposedly its only reliable regional partner. Anti-Obamaism and the nuclear agreement. The preceding factor was one of two major reasons for opposition to the Joint Comprehensive Plan of Action, the multilateral agreement that severely restricts Iran’s nuclear program and closes any possible path to a nuclear weapon. The other major, and very partisan, reason was that the accord was probably Barack Obama’s biggest single achievement in foreign policy. Trump, who scathingly denounced the accord during the campaign and whose administration only grudgingly acknowledges that Iran is complying with its obligations under the agreement, still shows a strong inclination to do the opposite of whatever Obama did. Now that the Republican effort to undo Obama’s signature domestic achievement, the Affordable Care Act, has run aground on the realities of health care, the urge may be stronger than ever to undo Obama’s signature foreign policy achievement. If it can be undone not through direct U.S. renunciation but as a casualty of some other confrontation with Iran, then so much the better from Trump’s point of view. Respectability given to regime change. Another of the adults, Secretary of State Rex Tillerson, recently told the House Foreign Affairs Committee that regime change is part of U.S. policy on Iran This comment resurrects a malevolent concept that amply deserves a place on the trash heap of U.S. foreign policy history, especially given the disastrous results under the previous two administrations of regime change in Iraq and Libya. The concept is no more suitable to Iran, where there is not some political movement in our own image that is just waiting to be freed from the yoke of theocratic autocrats through a new revolution. Those with other reasons for promoting hostility toward Iran also have been promoting the regime change idea. The Sheldon Adelson-funded Foundation for Defense of Democracies, for example, shortly after the inauguration was pushing a paper at the National Security Council centered on regime change. The specific notion usually being pushed is that forms of subversion short of armed conflict would do the job, but the fantasy outcome of a new and attractive regime in Tehran can easily become an objective of military operations initiated, or ostensibly initiated, for other reasons. Meanwhile, the rhetoric of regime change adds to tension and distrust between Tehran and Washington that make destabilizing incidents increasingly likely. Mission creep in Syria. The crushing of the so-called Islamic State’s caliphate is close enough to completion that the difficult and deferred question of what becomes of the Syrian territory that had been part of the caliphate now must be faced directly. 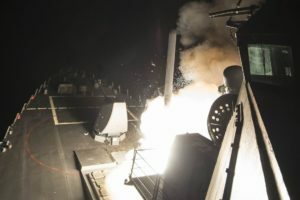 Much commentary on this question in the United States is advocating what amounts to a significant expansion of U.S. objectives in Syria by confronting the Damascus regime and its Russian and Iranian backers. U.S. actions on the ground and in the air already have moved in this direction. Incidents have included shooting down Iranian drones and a manned Syrian aircraft, as well as U.S. attacks on what were described as “Iranian-supported” militias. It is remarkable how much the mission in Syria already has creeped and evolved. The evolution of objectives in the next five months could be just as rapid as in the last five.Given Iran’s significant role in Syria, and the expanding U.S. role there, Syria is one of the places most likely to spark direct warfare between the United States and Iran. Displacement from Russia. Incidents with the Syrian regime’s other major backer, Russia, certainly are worth worrying about along with incidents involving Iran. But some of the very reasons for special worry about direct armed conflict with Russia — a nuclear-armed ex-superpower — are also reasons to expect special restraint, along lines similar to what the United States and the USSR displayed throughout the Cold War. Moreover, under the Trump administration Russia does not play the sort of automatic, take-for-granted-as-an-adversary role that Iran plays. We have yet to fathom the full reasons for Trump’s more qualified and even benign posture toward Russia, but there clearly are such reasons. If the administration needs to strike at one of the beasts involved in the Syrian war, that beast will be Iran, even though Russian support probably has been at least as important as Iranian support in shoring up the Assad regime. Delegation to the military. Trump’s practice of delegating to the Pentagon major decisions, even of a more strategic than tactical nature, involving deployment or use of military forces could in some circumstances be an encouragement of restraint, given the disinclination of experienced military officers to be thrust into new conflicts in which the United States is not already involved. But the United States is already involved in places such as Syria and the Persian Gulf where confrontation with the Iranians is possible, and with such involvement the military bias is in the direction of doing more rather than doing less. The bias is toward being more aggressive to accomplish presumed objectives and especially to protect American forces. At least one U.S. attack so far in Syria has been justified in terms of protection of U.S. forces. Military decisions taken for military reasons may spark an expanded conflict. He has used the relatively minor link between a Yemeni group and Iran as the excuse for prosecuting a war that has turned Yemen into a humanitarian disaster. His most recent destabilizing move has been the fracturing of the Gulf Cooperation Council for the sake of bashing Qatar, one of whose listed offenses is to have more-or-less normal, peaceful relations with Iran. 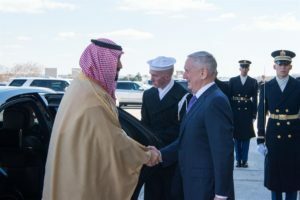 The potential for the United States being dragged into an escalation of this mess is significant, especially given Trump’s inclination so far to go all in with the Saudis. Brinksmanship in the Persian Gulf. Even without the added recklessness of young princes, the Gulf is the other most likely place, besides Syria, for an incident involving U.S. and Iranian forces to escalate out of control. The U.S. forward presence in what the Iranians regard as their maritime backyard is more than matched by the sometimes reckless and unsafe maneuvers by small craft of Iran’s Islamic Revolutionary Guard Corps. The recent fatal collision of a U.S. Navy destroyer with a merchant ship in Japanese waters shows what can happen in crowded sea lanes even when there is no international conflict or animosity involved. Imagine something similar happening in the Persian Gulf amid the current hostility in U.S.-Iranian relations, with no apparent interest by the Trump administration in restoring a diplomatic channel for defusing incidents. The nature of the person in the White House. In his Congressional testimony, former FBI Director James Comey mentioned “the nature of the person” as a reason for meticulously documenting his conversations with President Trump, meaning that Trump is a serial liar. The first five months of Trump’s administration is sufficient to see that the lying extends not just to individual falsehoods but to large segments of his policies. On domestic and economic policy, the populism he voiced and that won him decisive votes last year has been revealed to be fraudulent, with health care being only one of the indications of this. There is no reason to suppose that what Trump has said about foreign and security policy, including vote-winning rhetoric about aversion to more foreign wars, is any less fraudulent. With the rhetoric being next to meaningless, other aspects of the nature of the person will be influential, including Trump’s impetuosity, his dwelling on the immediate at the expense of longer-term consequences, and his insatiable appetite for personal approbation at the expanse of broader national interests. None of these qualities augurs well for avoiding conflagration with Iran. Diversion from difficulty. These personal qualities of Trump make him a prime candidate to turn to the time-honored tactic of using foreign conflict to divert attention from domestic troubles and to win flag-rally popular support. His current support, according to the latest poll on the subject, continues to fall. Armed conflict with Iran would be an enormously negative event for U.S. interests on several grounds, beginning with whatever expenditure of American blood and treasure was involved. Other consequences would include giving a gift to the most hardline elements in Iranian politics, possibly leading to renunciation of the nuclear agreement and the opening of a path to an Iranian nuclear weapon, as well as collateral damage to U.S. good will and relations with many others, beyond some hardliners in other places who would welcome the spilling of American blood as long as it was done in the service of attacking Iran. One can hope that that there will be enough thinking about such consequences to prevent such an armed conflict from coming to pass. We came within a hairs breadth of a war with Iran in 2006. US policy is so haphazard, conflicted, arrogant, complacent and generally brainless that war on a scale we have not witnessed this century now appears all but inevitable. The only question is when and where. Given current trends, the when is likely to be very soon. The where for the initial spark is anybodys guess, but obvious candidates are Syria, Iraq, Iran, North Korea, Eastern Europe and Ukraine, South China Sea. There are other possibilities, like Yemen or some joker in the pack that isn’t immediately obvious. The whole world is a powder keg with clowns like Trump, Netanyahu, Salman, Erdogan and the like flicking lighted matches around. If anyone else has remarked about the unusual large type of this essay I missed seeing that remark. Trump (or whoever is actually in charge of the US government) almost has to be running several bluffs. The US just doesn’t have the resources any more to do a regime change in North Korea, Syria, and Iran while simultaneously trying to appear threatening to Russia from every point in Europe. Existing military infrastructure has to be maintained if it is going to work when needed, and it hasn’t been. Buying spare parts has been sidelined in favor of shiny new toys which are absolute money pits. I’ve been led to believe that the US Marines are the reason the US is blowing a couple trillion dollars on the near worthless F-35. But since the Marines are not one of the best endowed services, and are relentlessly spending on their special VTOL F-35s, they obviously don’t have a lot of money left over for the basics. Will the magic airplane be worthwhile? Frankly, I doubt it. Close air support means exactly that – you’ve got to fly down close to the surface and try to determine who is who on the ground. The F-35 won’t carry much ordnance and still be invisible to radar, and the thing is also too fragile and expensive to put it at risk of ordinary gunpowder infantry weapons. I’ve been nursing a theory about why so many nations are purchasing the F-35. IMO a great many of them want a few physical samples as a jump-start for their own stealth airplane programs. They’re buying mountains of technology for a pittance. Iran may be a target; on account of the imbecility of the Trumpies a person can’t dismiss the possibility out of hand. It’ll be interesting to see who (if anybody) is the next nation to get an attempted stomp job. For Freedom, of course. Zachary – “They’re buying mountains of technology for a pittance.” You’re probably right there. “Trump (or whoever is actually in charge of the US government) almost has to be running several bluffs.” Yes, I think that’s what Trump likes to do, just as he bluffed Comey with the threat of having taped their conversations. God knows what he’s doing, but I don’t think he’s getting ready to attack Iran. That would just be stupid. But he’s probably using his threats as leverage for something else, like taking a slice of Syria or something. Does anyone remember how we in the West won? We tried to discredit the USSR and were successful. Remember how we made jokes of Yeltsin? Yeah what a funny guy that Yeltsin was/ drinking vodka , we got him. Now Putin is not drinking vodka, and he is serious, He has to do nothing, because we have made a mockery of democracy. Remember, we used to mock the former Soviet Union, because of whatever reasons, Now, the world is mocking us because we are no better. and maybe that is not a bad thing that someone put us in place. Well it is the maritime backyard of Iran, is it not? They don’t call it the Persian Gulf for nothing. Forward presence more than matched…that’s a good one. “Reckless” is the hallmark of our “forward presence” in the Mideast. The U.S. has been “confronting Damascus” and the Syrian people in a most reprehensible form for six years. It’s time to cease and desist. Getting out of Syria is the best way to protect American forces. It is not our prerogative to determine Syrian terroritory. The brave Syrian Army with help from Russia and Iran deserve the credit for crushing the terrorist mercenaries that the U.S. supported. Instead of toying around with a rejection of regime change (because of “results” and/or the lack of a “political movement in our image”), why don’t you reject it on principle? Instead of just noting the “verbiage” as a “substitute for thought”, why don’t you write a thoughtful article about Iran and its people, history, and what it is and is not doing? It’s yet to be seen whether the “agreement” with Iran will be an Obama achievement or just another long-game ploy to say “well we tried, but Iran is Iran…”. Obama, after all, didn’t do much to dispel the misguided notions underlying the “verbiage”. (Or any other false notions underlying U.S. foreign policy for that matter). And by the way, the so-called ACA is not an achievement…it’s an affront to what true “insurance”, and by extension, what true health “care” should look like in America. Thank you for for your comment. They mirror my thoughts exactly. We should be waging peace as a matter of principle, and respecting the sovereignty of foreign nations. The people who are trashing Trump and the GOP over the removal of the ACA fail to realize that there is nothing affordable about the Affordable Care Act. The high deductibles put care out of reach for many, and the individual mandate forces people to buy something that in the end does them no good whatsoever. It is a big give away for the insurance companies. The only thing it did was allow people who used to go to the emergency room for care to go to a doctor’s office instead. And it put the burden of the cost for that squarely on the backs of middle class Americans. Single payer is the only solution, and the latte sippers try to pretend that Obama accomplished something when it was really a fiasco. Of course, I am not excusing Trump for failing to deliver on his promise of “really great” health care. Like so many of his promises, it was pure hot air. Well, Dave, all the way through the campaign, Trump talked about how jobs went to China and he wanted to bring them back. Advisors could be thinking about pressuring China geopolitically, but all articles say his cabinet were all against tariffs but Trump prevailed as President. Russiagate started his presidency so badly it’s hard to see any possibility of turnaround, we’ll have to wait and see. But I doubt this move will do anything other than help to tank an already-tanking economy. And on casino mogul Adelson, how close is he to Netanyahu? Everything for Israel? I have a feeling a second “Operation Ajax” isn’t going to work in Iran. Iran is a lot stronger now. In the article Mr. Pillar cites Sheldon Adelson funded “Foundation for Defense of Democracies” pushing a paper through National Security Council centered on regime change in Iran. In a properly functioning just Democratic Society, the government will ask Sheldon Adelson to change the name of his outfit to “Foundation for Defense of Financial, Media, and Entertainment Oligarchies”. We sure live here in an Orwellian World. Dave P. – yes, you hit the nail on the head! They come up with these nice-sounding titles that use words like “democracy” or “humanity”, but what they really mean is: “Foundation for Shearing the Sheep” or “Council for Shaking you Down”. New development from Trump today to impose tariffs on China, overruling his cabinet, just hit the news that he’s starting a trade war, and it’s obviously to appeal to his base. How’s that for more confusion along with war? Jessica, I think Trump is trying to scare China, putting pressure on China to tear it away from Russia. U.S. and Western Nations are like a tribe of wolves hunting together. Just like wolves, they want to separate their victims by all kind of maneuvers, and go after the victims one by one, and kill them. We are in for some very scary ride now. I think the United States would be most happy to allow all countries in the world to develop. Their only requirement is that THEY be allowed to own all the oil and resource companies (at least be partners in them), control and own the banking in these countries, and that they get to choose the puppets who govern these countries. I mean, this IS what happened in China. Their elite have been made filthy rich by the U.S. going in there, handing them U.S. technology on a silver platter. All they had to do was offer up their citizens as slave labor and pollute the crap out of their country. Done. If China had tried to do this on their own, it would have taken them many decades to get up to speed. Instead, U.S. technology and manufacturing was just moved from the U.S. to China. The Chinese elite were more than happy to pollute their country in order to get rich, and the U.S. elite were more than happy to sell out their citizens’ jobs. The corrupt Chinese elite moved West in order to hide their ill-gotten loot and to escape the pollution they had caused. The U.S. elite made a fortune, but hold their loot offshore in tax havens. Russia is twisting. The U.S. are telling them to open up to their companies, let them own the country, but Russia says no; they do not want to sell their country down the river or lose their sovereignty. backwardsevolution: Thanks. A very accurate and I would say perfect analysis. backwardsevolution: I might add that yes, there is 1% who have own lot of wealth in China, but a very modern China has been built – Around 15000 miles of high speed trains, super airports, modern highways , and gigantic very modern cities. Also, China has built a very large middle class. This neoliberal economy does create great Wealth, as it uses lot of slave labor, involves lot of exploitation. What China gained has been Middle class’s loss in U.S.. U.S. also helped create modern South Korea, Japan, and Europe – all at the expense of American middle class. Those high paid, secure jobs are in Germany, Japan, and S. Korea now, not here. The U.S. elite made a fortune as you said. Only country we have been beating at is Russia. What a foolishness! After the 1991 collapse, they proposed to give just about everything to be a part of the West. In Russia, they have to create some wealth first before they start distributing again. It is not going to be easy with these sanctions and no access to West’s technology. I believe that U.S. is going to be a very rich Nation for the foreseeable future – lot of foreign money, and talent is flowing in from the Third World Countries. By 2050 – if there is no nuclear war – U.S. with over 450 million population is going to be an even much bigger Empire. But to what end! The Western Culture as we still see it now in Urban areas will retreat still further into the deserts , and cold climate regions of the country. In it’s place, there will be unrecognizable consumer culture. I liked America as it was in 1960’s. To clarify my comments above we do have consumer culture here and in many parts of the world already. However, when U.S.and the West starts these wars in other countries, the slogans used are: We want to bring freedom and democracy, which is not true. They also say they want to impose American/Western values. One might ask what are those values? Countries had cultures, and they had there certain values. But with this Neoliberal Global economic agenda , the West is obliterating cultures and with it the cultural values or whatever you want to call it. In this process same thing is happening here. U.S. is building this empire. But the population has not been told why we are doing it. In this building of Empire , the Middle Class, as it used to be, has been decimated. The country is getting rich. The wealth has gone to top 1% or so. So, all these wars are being promoted by the Wall Street Financial, Media, and Entertainment Oligarchy. They are the one who shape public opinion with total control over the media, entertainment industry, think tanks, academic institutions. These are the people who are getting richer and richer. There are other actors like MIC, and Oil Industry but their influence is less significant. This globalizing agenda of the Neocon Neoliberalists is effectively destroying the Western Civilization. And there are not many values left here to be transmitted to the world beyond. Dave P. – good posts; I agree. I don’t have a problem with the regular Chinese people. They’re getting shafted too. But I do have a problem with the Chinese elite, just as I have a problem with the Western elite. As you say, they are destroying countries, cultures, and traditions with this neoliberal/globalization crap, and all so they can get richer. When is enough, enough? And to just pack up and haul all of the technology that decades of hard work, research and a ton of taxpayer money went into, and take it to another country – well, how patriotic is that? Talk about selling your own country out! That’s what makes me angry. Mike Flynn had to resign because he, while on holidays and probably in his bathing suit sipping on a margarita, talks to the Russian ambassador and that’s all bad, bad, bad. Why, he could have been selling the country out, they say. Well, what he did was nothing compared to the sell-out that the revered corporate citizens did when they shipped the jobs overseas and gutted their own country. It just doesn’t seem right to me, Dave. backwardsevolution: Yes, I completely agree. They have shipped just about all the technology overseas, including to South Korea, and Japan too. I worked on some of those projects. They have sold the whole shop. It seems to me, only patriotic people left are those Hillary called “Deplorables”, and the ones who are interested in the news sites like the Consortium News. Mike Flynn’s conversation with the Russian Ambassador was normal part of his job after the election. Sipping Margritas on the beach, he may have said something to the effect that we will try to take a fresh look at the sanctions and other issues. What is wrong with that? The whole Russia scam is being perpetuated because they are not under the control of this Wall Street Financial, Media, and Entertainment Oligarchy. Who in Russia wants to be under the control of this Oligarchy after what they did to them during 1991-2000. This Oligarchy has brought this country to the stage it is in. They want to make slaves of Russians too. Trump is pathetically weak, letting the Pentagon call the shots. The Trump administration acts drunk, lurching one way, then another. Tillerson shows how unseasoned in government he is. Nikki Haley just seems to enjoy her new mouth-running power. How much more warmaking can the USA really pull off and be “successful” at it? I just don’t see it, the world is in crisis mode because of the USA and NATO and everyone sees it but the Western nations. The Sputnik article from Dave P. points out the elephant in the room, the economy. Recent articles show that the Western economies are weak overall. The GCC nations are clearly in crisis, too. The Eurasians are the only ones making sense: China, Russia and allies, and of course the nasty West will do whatever tricks they can to spoil their success, but it’s obvious the Chinese and Russians are smarter than the fools running the West into the ground. Russia has asked China to invite Iran into the OBOR project and the Shanghai Cooperative Bank. More power to them. A video recorded in 2001, a few months before 9-11, shows Benjamin Netanyahu speaking frankly in Hebrew about Israel’s ability to manipulate relations with the United States government. Netanyahu was filmed in the Israeli occupied settlement of Ofra in the northern West Bank. Israel seized the West Bank from the Jordan during the 1967 War. Some 60 percent of the built-up area of Ofra and lies on land privately owned by Palestinians, including areas located in the heart of the settlement. Netanyahu was bragged how he undercut the Oslo peace process when he was the Israeli Prime Minister during the Clinton administration. Netanyahu asks that they turn off the camera so he can speak to them “freely”. The camera gets turned on again in mid-conversation. That was Netanyahu before 9-11 and the launch of multiple US wars to fabricate a “New Middle East” instigated by neoconservative and liberal interventionist ideologues to the delight of Israel’s far right Likud government. 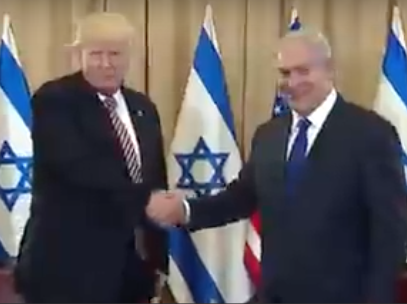 With the destruction of Iraq, Libya, and Syria, Iran is next on the war agenda and Bibi is still smirking. Thanks Abe. A nice glimpse behind the curtain. Mike K, I think it is not the rich per se, instead internationally linked pharaohs (symbolized by immense global reach wealth and power) that renders entrusting human rights security to those few elected to serve as slave driver to the Pharaoh to be an extreme security risk. The unbalanced 2-group-republican type structure of government (where one group has total access to knowledge and information, use of the military strength and police power, and 92% ownership and control over the fake news media and the other group has none of these things and no effective recourse to deny the abuse of these things); makes republic type governments, the world over, extremely unsafe for humanity and common man. <=I think even though it is highly efficient, it is a security risk; big time! Profile 1) the unpaid, kept in the dark, governed (340,000,000 in the case of America, with % power) the governed group versus 2) the paid, connected, always informed (000,000,527 in the case of the USA, elected persons, plus their 2.5 million highly paid technically-savvy military and bureaucratic supporters, who possess 100% of the power) the governor group. The USA is the paid group vested with all of the power; Americans, not in the salaried group, are governed Americans with no power. At least that is my analysis? You are right fudmier to call attention to those not quite at the peak of the pyramid of power. Of course the super wealthy will not pick up guns or fly planes to achieve their goals, there are many echelons of helpers to accomplish those tasks, but it remains true that those at the peak of power call the shots and maintain control over those below them on the pyramid. MSM broadcasters for example are very richly paid for their services putting out propaganda. But if they step out of line with their employers wishes, they will quickly be out of job. Of course Senators in the Congress face the same fate if they are noncompliant. So just because the henchmen and women are often well paid by the super rich, they do not have the same power as these Power holding individuals. The Deep State of the Super Wealthy has many puppets, but they do as they are told or else. You see, we are dealing with individuals who have the power to warp and destroy millions of human lives. And they exercise those powers without a shred of conscience or remorse. These are people deeply perverted by the power they wield; they are monsters of Evil. Please do not cut them any slack whatever in your mind; they do not deserve it, and they will use it against you and others. I am not speaking of anything theoretical, the evidence of their horrific crimes is all around you. Thanks for the link Dave P. Very revealing. Capitalism has always been about war. This is a naked drive to impose Economic Colonialism again on the Countries of Asia, Africa, and South America who had, many times through very violent struggle, won their freedom. It is not U.S. alone; the Western European Imperialist Countries are complicit in it. This new attempt to impose their Rule is even far more brutal than Christopher Columbus, Spanish Conquistadors, and the other Western European Countries Britain, France, Holland, Belgium, and others did during those four hundred years of colonial history. In addition to economic damage, death and destruction, this time it is going to be the complete destruction of the cultures of these unfortunate countries.. All we can do is wait and see. The White Man takes up his “burden” again. What’s in that heavy sack he is carrying? Gold, resources, slaves. The Rich are not fond of social services which are an expression of our care for each other. They condemn all of this as “socialism” supposedly a great evil. Instead they offer us a job in the military or some industry increasing their wealth. If you don’t like it you can sleep in the street or go to prison. Trump’s policies are all directed to reward the Rich, and penalize the rest of us. How can so many not see this? The power of propaganda. What is the antidote? Get out the truth. Starting from current reality; What’s your solution? Well now that the Democratic Party has pivoted to be pro-war, Trump shouldn’t face too many objections. The democrats have always voted for war. There is no pivot. The Rich are enemies of democracy. Although they use rhetoric seemingly praising democracy, their real motives are to undermine any real democracy and destroy it. The ancient conflict between the few and the many continues in many forms. The few are eager to have all power and control in their hands, and to use the many for their purposes, and deprive them of wealth and power. All that we see playing out on the world stage today becomes more transparent when we keep this fundamental dynamic in mind. If you lose sight of this dimension you will become confused and lack the basic key to understanding current events. Our basic problem at this point in our human drama is whether we can learn to live together in peace and harmony, sharing the blessings of our world as equally as possible with each other. If we do not solve this problem soon, the odds are we will destroy our species and go extinct. Again, unless we keep this reality clearly in mind, our efforts will be either futile or self-defeating. I am saying something very simple: the Rich are the enemies of all of us, and they will do anything to dominate us, including fomenting totally toxic and destructive wars, using us to be agents of their insatiable desire for the fruits of piracy of the world’s resources. Their propaganda disguised as patriotism has convinced many to become their unwitting tools in this fiendish enterprise, only for these pawns in their game to return home broken and deeply disillusioned by their betrayal by the country they trusted. The most dangerous threat of all is a conflict with Russia, which would basically end civilization. And, that is being pushed by Democrats (who would have thought), not Donald Trump. Every indication was that Trump wanted to repair relations with Russia and get out of all these idiotic wars, but that is blocked by ‘Russia-gate’ one of the most despicable, dishonest, and dangerous political ‘movements’ in our history. And we can lay that at the feet of the Democratic Party, of which at one time I was a proud member. You are wise to have severed your connection with the dems Steve, They are opening the Gates of Hell. The newly minted Trump Administration is reluctant to learn from America’s long involvement in Iran and the geopolitical instability that the United States actions have created in the region.